Oh, what we find in the trash! When I hung up the phone, I put down my work and drove over to my friend’s apartment complex immediately. I soon had a barely used acoustic guitar and a bike that’s far too large for me. Guitars and bikes seem to go together; I’ve known many players who ride, and many cyclists who knew how to play an F chord with ease. Road bikes require contorting your back to get over the bars, and guitars require twisting your left hand’s fingers into strange contortions. I wonder if the original owner gave up on biking and making music? The guitar is a Galveston WJ-750 acoustic steel-string. 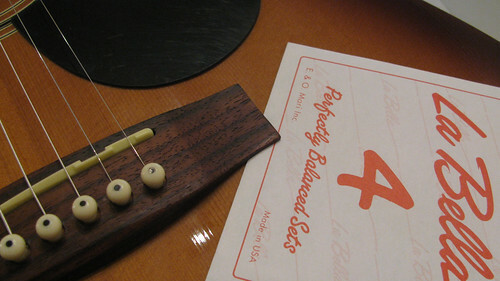 Those strings exert a tremendous linear pressure, s on all strummin’ guitars. The bridge, as you can see in the photo, is slowly peeling itself from the top of the guitar; I could fit a piece of paper into the corner under the bridge, which you’re not supposed to be able to do. I give it a few years until the guitar no longer stays in tune, and not much more time until the bridge comes off completely. I’ve found a potential future home for it, with my ten-year-old nephew if he decides to take lessons next year. Until then, it’ll be my backup guitar and I’ll see about re-glueing the bridge, in a (non-futile, I hope) attempt to forestall the guitar’s eventual implosion. The bike is a Ross Professional Grand Tour, probably from the late 70’s. It’s a large frame; I can’t even stand over the top tube without hurting myself, let alone ride it; the first dismount at a traffic light would hurt. The frame fits my friend and bandmate perfectly, though. He’s already ridden it to work and back, and reports that the bottom bracket, essentially the axis the pedals rotate around, seized up on him while riding, so that’ll have to be replaced. Other than that, he’s quite happy with the bike, and he thinks it’ll be a good “around-town” rig.